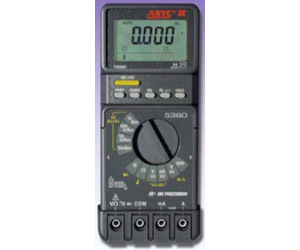 The 5300 Series handheld DMM is the most advanced digital multimeter available in this price range. These meters incorporate a special 50,000 count integrated circuit for high-accuracy (0.025%) basic accuracy, high-reliability design. Measure AC Volts (True RMS AC, AC + DC), Resistance, Capacitance and Frequency, in addition to dB, Duty Cycle, Pulse Width, Power Line Disturbances and Temperature. These meters also feature fuse and battery access without breaking a calibration seal, great for ISO facilities. All models offer Peak Hold, Hold, Relative Mode and Backlight.